We recently got a new computer. To say that it was long overdue is an understatement. I could turn on our computer in the morning and darn near shower and do my makeup and hair by the time the emails had downloaded. In surfing around my new computer, I got to looking at my website and I noticed, sadly, how out of date my bio was. It said at the end that Al and I lived with our three dogs. Hannah, our black Labrador retriever, Watson, our PBGV and Rosie, a Yorkie mix that we adopted from the Humane Society in Detroit, Michigan. 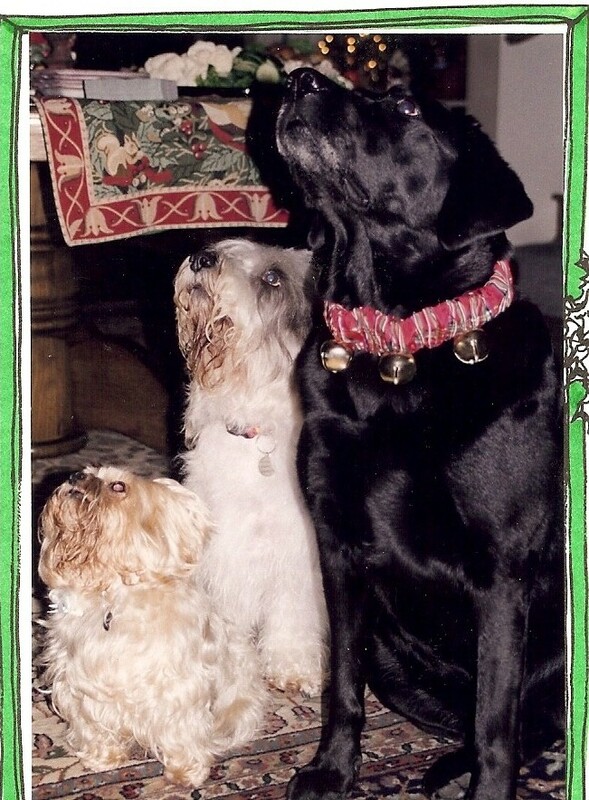 We lost all three dogs in the span of a difficult year that ended two days after our anniversary last November 16th. I know exactly because Rosie died on November 18th, 2007, two days after our anniversary, and I put Hannah down on November 17th, 2008. One day after our anniversary. Now that the kids are grown and out of the house, our dogs are our family, and these three, of all the dogs we have had over the years, were most special to me and Al. This little pack, me the Alpha dog, Al the enabler and Hannah, Watson and Rose were particularly close. Al and I celebrated our 33rd anniversary on November 16th of 2007. Celebrate is probably the wrong word. Hannah had been diagnosed with Melanoma that summer. There is a Melanoma vaccine for humans that they are now giving to dogs and Hannah was doing really well but mid November she developed a bladder infection that turned into a liver infection and Ecoli. We were scheduled to take my show on the road the 15th and Al said to me, "I need to stay home with her. If something happens to her, I want one of our faces to be the last one she sees." I took off for Texas with my crew. While I was flying, Al had to put Hannah in the hospital and was asked to sign the "do not resuscitate" papers. He was a wreck. I did my show on the night of our anniversary and I remember crawling into bed and crying until the pillow was soaked and then because Al wasn't there rolling over to the dry side of the bed and falling asleep exhausted, sure I would never see Hannah again. The next day my crew and I had to drive to Shreveport to do the show. By then, Hannah was actually responding well to her antibiotics and Al said we would be able to pick her up from the hospital when I got home. I had to connect through Houston to fly home. I couldn't wait to see Hannah. When I landed in Houston and turned on my phone there was a message from Al that was nearly incoherent. All I could really understand was "Rosie" and "dead". She had apparently had a heart attack in the middle of the night and Al found her in her little bed the next morning. Let me stop for a minute and paint you a little "Rosie" picture. It's winter in Detroit, 2002. Not a snowy, pretty winter but a bare, dry, bone chilling, cold winter. I have been invited to Detroit to co host their annual Humane Society telethon to raise much needed funds for the shelters and to hopefully find good homes for some of the animals. Al went with me rather reluctantly. "No more dogs, right?" he kept saying. "Absolutely not", I agreed. Three story beach house, virtually no back yard, 2 dogs, more than enough. When we toured one of the shelters it confirmed for me the "no more dogs" issue. They have a huge inner city dog problem there. Lots of big dogs, Rottweilers, German Shepherds, Pit Bulls whose owners have encouraged them to be aggressive. Then when the dog gets into trouble they get confiscated. Most of them, I believe, would be a handful to rehabilitate. Consequently, I settled in and proceeded to just take care of my hosting duties. During the course of the six hour telethon, handlers would bring various dogs that needed homes out before the television audience. It was going well until the last half hour of the telethon. I turned around to see a volunteer holding a little Champagne colored fluff ball. "Who is this?" I squealed curiously. "This is Rosie", she replied. "Someone dropped her off 3 weeks ago and said they couldn't take care of her anymore". "Why on Earth?" I asked. "She is so adorable." "I don't know," she said sadly. "She's about 5 years old, she's fixed, no behavioral problems that we've noticed…" I scooped Rosie up in my arms and she scooted her way up into the warm curve of my neck. She didn't move. "Oh, my God," I said. I went to the stage manager. "I need 5 minutes. Could I please be excused for 5 minutes? I need to go backstage really quickly." Backstage, meanwhile, Al was sitting in my dressing room watching this whole thing unfold on camera. When I rushed breathlessly into the room, clutching Rosie, he looked at both of us and said simply, "crap." "What am I going to do?" I asked. "I guess we're taking her home," Al said. "Well," I rationalized, my girlfriend Cherie had said to me before we left home, "If you see anything cute and white, bring it to me. But I want it to be cute and white." I seated Rosie on the sofa next to Al and crossed the room to sit and call Cherie. As I was placing the call I smiled and said, "Rosie!" She came scurrying over to me like we had been together forever. Cherie answered, I was breathless. "She's little, she's cute. She's not quite white, Cherie, but she's Champagne and you know how much you love Champagne!" I pleaded. "Oh, my God, Vicki, I haven't even asked my landlord yet." "What'll I do?" I asked frantically. "Just bring her home," Cherie said. "We'll figure it out." Long story short, Rosie had kennel cough and had to stay in Detroit on antibiotics. 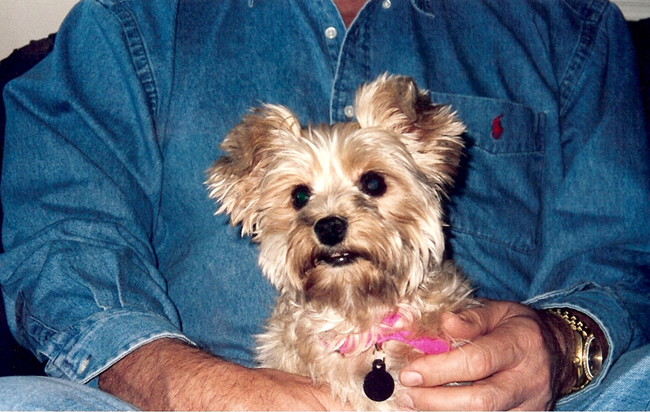 By the time she came to LA, I don't know about Rose, but I was having serious separation anxiety and Cherie had still not gotten permission from her landlord to have a dog. I marched Rosie into Cherie's store, La Bella, knowing full well how cute she was and that Cherie would have to take her. But every move I made, Rosie was glued to my feet like a little child begging to be picked up. By me. Only me. "She's already bonded to you," Cherie said. "No she's not," I insisted. Cherie just laughed. "Don't be ridiculous, Vicki. She's your dog." Then she said, "You'll change her name, right?" I said, "Why?" "Rosie O'Donnell," she said. "She doesn't really remind me of Rosie O'Donnell," I laughed. It never occurred to me. "She's Rose. Rose Dawson, "I said. "You know, like from the Titanic. We rescued her and she is not going down in Detroit. She's a survivor." And so it was that 7 years later, 2 days after our anniversary we took little Rose to be cremated. It was the last thing we expected. I tried to no avail to get through the Houston airport without sobbing. For the longest time, I expected to see little Rose come running. Sometimes I was sure I had seen a glimpse of her and I would have to shake myself out of it. I still wish I could roll her over on her back one more time and tickle her little pink tummy with my nose. She loved it. It made her smile. Hannah came home from the hospital and proceeded to give us another year. Meanwhile, our handsome guy Watson had developed a bad heart murmur. 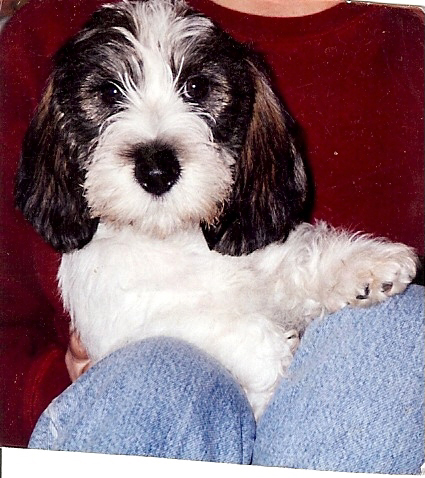 Watson was a Petit Basset Griffon Vendeen. The most highly pedigreed and expensive dog we had ever purchased, descended from a long line of champions from a fabulous breeder in New York. You can see Helen and Charlie Ingher's magnificent dogs at www.charlen.com. They are now located in Florida. I met Watson when he was about 8 weeks old. I was rehearsing a play in New York City. 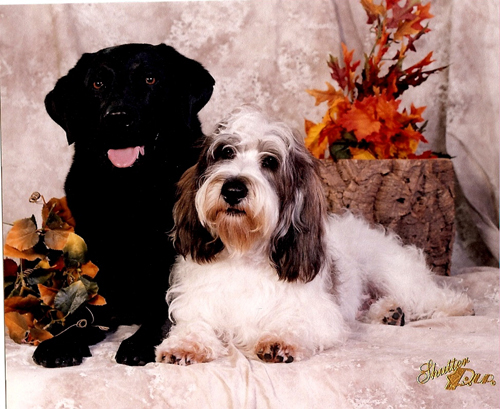 I had learned about PBGVs when we had one on my talk show and the trainer had said, "You should have one of these, Vicki. They will make you laugh." We weren't ready to get another dog at the time but it was through him that I started corresponding with Helen who was not only his friend but a highly respected breeder of PBGVs. I knew every time she had a litter. Every time she had a champion. When Hannah was about two and a half, Al started looking in pet store windows and insisting that she was lonely and needed a buddy. I kept having to remind him that Betty White had forbidden us long ago to ever buy another dog that was being sold in a pet store. Still, he kept looking and as Christmas drew close I got really concerned. I told him I was calling Helen. I told her I thought we were ready. She said to me, "Well, as luck would have it, I have a litter that will be ready to go in a month." I told her that I would be in New York in a month working. She said sharply, "Good. Because you need to come out here and meet this breed and spend some time around them." Basically I was being summoned to come for an interview. It was a first for me. After getting settled in New York I asked my co workers one afternoon if someone would drive me out to the Putnam Valley after rehearsal to meet Helen and her dogs. Finding someone in New York City with a car was the first hurdle. Coercing our piano player, Leo to drive was next. "Leo," I bargained, "if you will drive me, I will take you anyplace you want to go for dinner…" "Anyplace?" he asked coyly. I said, "Anyplace, given the way we are dressed, ok?" "Fine". He relented. Off we went, Leo behind the wheel of a barrowed car and me navigating. We drove up the river and across the bridge and it will never cease to amaze me that 45 minutes outside of Manhattan you are in the country. I mean literally, "drive past the lumber yard, if you pass the church you've gone too far." Left, up a dirt two track, up the hill to a 250 year old farmhouse on 10 acres with PBGVs everywhere. It was heavenly. On that cold January night in 1998, I sat on the living room floor in that old house and played with Watson and his sister. I had thought that I wanted "Phoebe the PBGV" but Helen agreed that Watson was more of a lover. I left, my heart aching to take Watson with me, but I had to go to Nashville to do this play. Al met me in Nashville. He was pretty sick. He spent a lot of time sleeping in my dressing room. I regaled him with stories about Watson. He didn't seem very receptive. When we finally got home, Al was so happy to crawl into his own bed. There had been little talk of Watson until early the next morning when Al rolled over in bed and whispered, "When is Watson coming?" My ears perked up, I was wide awake. "When do you want Watson to come?" I asked. "Today. "he said sleepily and he rolled over and went back to sleep. I bolted out of bed, flew downstairs and got on the phone with Helen. She is a dog person who does this sort of thing all the time, so very matter-of-factly she said, "I have to pick up a friend in New Jersey today. I could put him on the nonstop from Newark; otherwise, it'll be another week before I get into the city." "Today!" I was so excited. I was like a kid at Christmas. I was nervous because I had never had a dog flown to me. The day seemed to last forever. Watson landed at 6PM and came out in his little crate with a bag of Eukanuba tied on top with a giant bow. He was just about the cutest puppy I have ever seen and he fell in love with Hannah immediately. We, as did Helen, fully expected Watson to outlive Hannah by years. It was Watson's bum luck to have a bad heart valve. If he were Al he would have been in surgery, but unfortunately they don't do much for dogs other than lots of diuretics to keep the fluid out of their lungs. Watson gave up the good fight on September 4th of 2008. He was not yet 11 years old. His breathing was labored. His large, shiny black nose and become dried and cracked and was so hot. His beautiful eyes had become glassy and distant. He had stopped eating a few days earlier and was refusing all meds. I had been forcing the meds down his throat for several days but that had become such a stressful task for both of us that I gave up and decided it was time to let him go. He wouldn't even drink any water. He just lay on his little cushion on the front porch where he had spent most of his time for the past few months. He didn't come in the house much towards the end. We would get an occasional visit upstairs which became such an unexpected treat. But it was almost as if he was trying to tell us he wanted out of here. The day before we put him down, I had coaxed and almost carried him out to the front lawn to tinkle. He ambled over to the rose trellis, plopped down underneath and closed his eyes. I ran inside for the camera. It looked to me like he was trying to get to heaven. I went into the house and made arrangements to have him put to sleep the next morning. Did Hannah understand that her buddy was going away? That it was time? The vet who put Watson down said that she thought dogs were much more Zen about the cycle of life than we humans. She assured us that Hannah would understand that it was her job to stay around long enough to ease us through the pain of losing Watson. For all our sakes, I chose to believe her. The day we did the deed, I was able to get Watson to come upstairs. Selfishly, I didn't want to be bawling like an idiot in front of the neighbors on our front porch. The time between making the decision and the arrival of the vet has got to be the hardest. I just wanted it to happen. To be over. I paced the house. Al paced outside. Watson just slept. It seemed like we waited for hours. When she finally arrived, the first thing she did was give Watson a shot to anesthetize him. She said it made the final shot easier for everyone and less traumatic. She said it would take 5 to ten minutes for Watson to go under. She went about her paper work. Al was across the room, looking out at the bay, unable to watch. I was sitting on the carpet, next to Watson, stroking his beautiful head and telling him how much I loved him and what a magnificent friend he had been. About 5 minutes went by and Watson stood up. We looked at each other, we looked at him. "Watson?" We were all stunned. He meandered over to the staircase and precariously started down the stairs. "Watson," I pleaded, frightened. I think the vet was in shock. I remember thinking, "Oh, my God, what is happening?" As calm and as strong as he has always been during any catastrophe, Al walked quietly down and scooped Watson up in his arms. "He wants to go to sleep on the front porch," Al said. "That's where he wants to be". And that's where Watson died. On his little cushion with me bawling uncontrollably. To heck with the neighbors. I had my hand on his chest when he stopped breathing. He looked so beautiful. His soft coat gently dancing in the breeze. His face so serene. Finally my boy was at peace. "He's not dead," Al said. "Yes he is, Honey. I felt his heart stop beating." The vet said she had never seen a dog get up and make the decision to go elsewhere after the initial shot. "He's really smart, isn't he?" she said. I don't know, maybe he was just trying to tell us all to leave him alone. But I will choose to believe that yes, he was smart and had a mind of his own to the end. Life with just one dog was quiet. Not necessarily easy, but quiet. 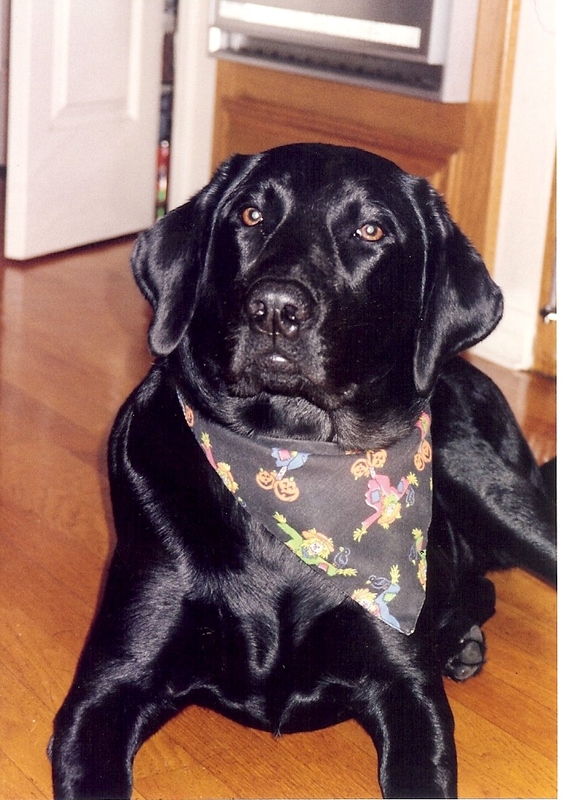 By now, the Melanoma had recurred on Hannah's right rear paw. Her cancer doctor said that although the vaccine had kept the cancer out of the rest of her body so far, it was not unusual for it to recur at the sight. She said that whoever had done the initial surgery had probably not gotten the margins needed to insure complete removal of all the cancer cells. It was the pad of her paw, after all. Not an easy surgery and a really difficult recovery because it's hard to tell an 85 pound dog, "just don't walk on it for a few weeks, Sweetie". The doctors at the cancer clinic of course wanted to start radiation immediately which sounds great until you get to talking about the recovery. She would have six treatments, two a week for three weeks after which her paw would "slough". A nice word for fall off. It would take time for it to start rejuvenating. In the meantime, it would be open and raw, hard to care for, uncomfortable and we ultimately determined, hard for Hannah to understand or cope with. By this time I had become pretty resourceful in the art of paw bandaging, with antiseptics, Telfa pads, athletic socks and self adhesive tape from our local drugstore. They were constantly reordering for me because I bought so much of it. 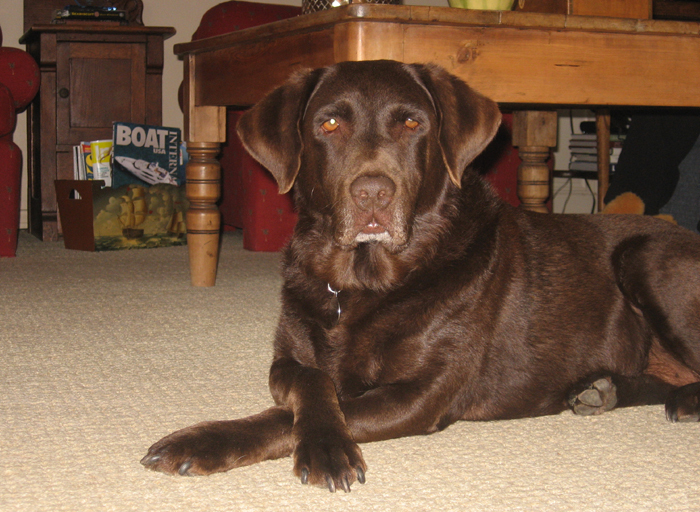 Hannah meanwhile, my beautiful Hannah, my gentle bear would look at me with those big brown eyes, heave a reluctant sigh and with an audible, guttural groan, lie down on her side and quietly let me rebandage her paw, twice, sometimes three times a day. Because she was beautiful, eating well and happy we opted out of the radiation treatments. "Realistically", I remember saying to her doctor, "how long is Hannah going to live?" "Forever!" Sarah wished for me. "Honestly, Sarah, I have this horrible fear that Hannah's paw will be a mess, she'll be on antibiotics, she will lose her appetite again, she'll be unhappy, we'll be unhappy and that's the way she will die." Sarah said, "I can't tell you that wouldn't happen". "So", I said, "we wish for Hannah a happier ending. We're going to go on like we are until Hannah tells us we're done." And it went really well for quite a while. I remember thinking often when I was wrapping Hannah's foot that maybe we could go on like this indefinitely. In the span of 9 months we had gone from a 3 dog, 3 story house to just Hannah. And the thought of losing her was just more than I could bear. Towards the end, Hannah lost her hearing. Well, I'm not really sure if she lost it all or if she had selective hearing. Kinda like your Grandpa. She would wander off on her own; ignoring the commands she had always obeyed so beautifully. Most notably, "no street" and "wait". She wouldn't wait if she wasn't in the mood. She had roses to smell. She had dogs and people to say hi to. In her old age she became like the Wal-Mart greeter. Even more so than in her childhood when Kong and her tennis ball were the most important things in her world. So for a while, I was walking all 3 dogs on leashes. It was like a Rubik's Cube dance. Hannah, the 85 pound Lab, Watson the 40 pound PBGV and Rosie the 10 pound Yorkie mix. I learned a whole new respect for those New York City dog walkers. I don't know how the heck they keep it all straight. One day, one of our neighbors laughed as we walked by and said, "Vicki, you all look like the Incredible Journey coming down the street!" With Watson and Rosie both gone I took to walking Hannah off the leash again. I could easily stay right with her and she much preferred it. One day, she took off across the park after a cat. Hadn't done it in years. There was no way she was going to catch it and she wouldn't have heard me anyway so I just laughed and let her go. Actually, I think I encouraged her, "Go Girl!" She came up short, limping on that back foot and looked at me as if to say, "Damn, what the heck was I thinking? I'm too old to be doing that kind of thing." I rubbed her head and said. "I'm right there with you, Bear. I know exactly how you feel!" One afternoon, we were slowly strolling home. We were coming to a street crossing when I saw a family coming our way on bikes. Dad was in the front, leading the way, two young girls behind him and Mom, bringing up the rear. I calculated Hannah's speed and determined that we could make it across in front of them before they got to us. So I said nothing to Hannah who was on autopilot. We made it and as Dad crossed behind us he shouted to his family, "Girls, on your right!-Hannah Montana's Grandma!!" Like I was a statue in the park! Made me chuckle. Oh, the joys of being a celebrity in a small town. I always figured you should get the dog of your dreams when you are a 9 year old boy. I was a forty-five year old woman. I never wanted a Labrador retriever. Well, let me rephrase. I knew nothing about Labrador retrievers. So I never knew I wanted one. My talk show had just been abruptly cancelled. It was a debilitating, exhausting dysfunctional, amazing, bewildering experience. And that covers the high points. I was not in a good place emotionally. 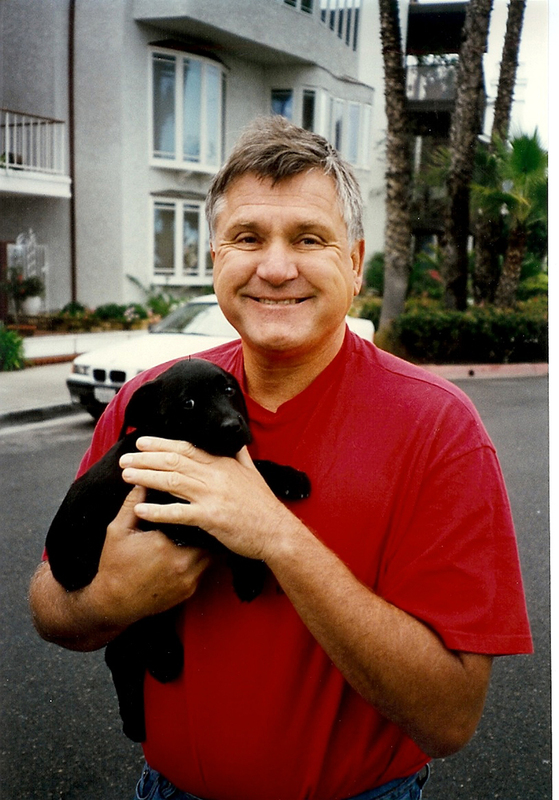 We had good friends that lived about a mile from us on our little island in Long Beach and every time Al would go over to hang out with Mike he would come home and say, "Their neighbors just had a litter of Lab puppies, you really should come and look." Or, "those puppies are disappearing; you really should come by." Or, "Only 2 pups left, you're gonna miss out." I finally relented. Courtney and I went over to the house to see. The pups were still nursing. Only 2 were not spoken for. The owners said that a gentleman in Palos Verdes wanted a yellow male to take hunting. I said that I would want a black female. "Good," they said…"that's the last one." 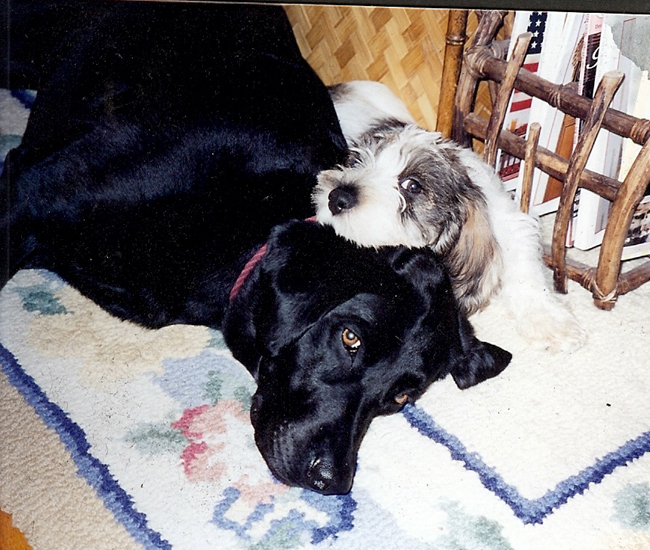 While I was still having my doubts about having a Lab in a beach house, Al came home on Valentine's Day of 1995 with that 7 week old black female and plopped her in my lap. "Do you have any idea how big this dog is going to get?" I cried. He knew. I think he also knew how good she would be for me. I put my nose in her puppy tummy. It was impossible not to love her. I named her Hannah because it sounded strong and wise. I engraved it on a big red heart tag and hung it around her neck and proceeded to set about making her the best dog in the neighborhood. To say that she saved my life sounds kind of corny but at a time in my life when nothing else made me smile, Hannah did. For almost 14 years. Towards the end of her life Hannah became so attached to Al. I knew that she loved me but she wanted to go everywhere with Al. She would follow him all over the house. If he got up, she would get up. If he went, she went. If he left without her she would sit right by the front door and wait for him to come back. She would walk with me, go bye-bye with me, let me bandage, feed, bathe and care for her but honestly, I sort of felt like the hospice nurse while Al was her "boy toy". I have to say, Al treated her royally. He took her everywhere with him and often said he was determined to make the end of Watson and Hannah's lives as happy as he could. It was not at all unusual to see Al pulled up to the local convenience store buying himself a lottery ticket and a bag of beef jerky for Hannah and Watson. Or at Kelly's Steakhouse at cocktail hour mostly because he could get some leftover prime rib for Hannah and Watson. So it is not at all surprising to me that Hannah waited for her dad to come home before she died. We had been on the road. We got home on Sunday the 17th of November. Rachel had been caring for Hannah and when she picked us up at the airport she said Hannah was having trouble walking. I hoped it was just a bad day. "She didn't want to go out this morning and I had to help her back up the stairs." That's where she was waiting for us, on the front porch. Al immediately took her to the car for what would be her last bye-bye. He lifted her into the car. He was back pretty quickly saying she just couldn't get comfortable in the back seat and wouldn't lie down. I prayed it was just a bad day. The next morning she wouldn't come out of her doghouse. I got a really sick feeling in my stomach. Al finally coaxed her out onto the grass where she pottied and then lay down on the grass. When I saw her lying there, looking helpless, I knew what I had to do. Al, meanwhile, lifted that big old girl in his arms, carried her into the elevator and got her up to the living room where she laid in front of the fireplace all morning. I made the arrangements and then left Al sitting with Hannah to go run a few errands. After a few minutes, Al called me and asked if he could leave. Could I do this alone. "You don't want to be here to say goodbye to Hannah? "I asked. "I can't," he said. "I've said goodbye. I can't bear to see them carry her out of this house. Besides, she's your dog." I knew this day was killing Al. I knew how much he loved this old gal that she had saved his life as well as mine. I also knew that it had always been Al's job to deal with our dogs when the time came and I had promised myself that I would not put that burden on him again. Furthermore, as strong and as loving as Hannah had been for me, I needed and wanted to be that strong for her today. I took a deep breath and thought for a moment. "You're right, "I said. "She is my dog. I raised her up, I will put her down." The vet who came to put Hannah down for me was very matter of fact. Not at all like the doctor who had put Watson down. It kind of surprised me and when I asked her about it she said, "If this were my dog I would be a wreck, and if we both fall apart nothing will get done." So true. So right. She was so good for me. She was very sure, very direct, not at all emotional and ultimately exactly what I needed that day. 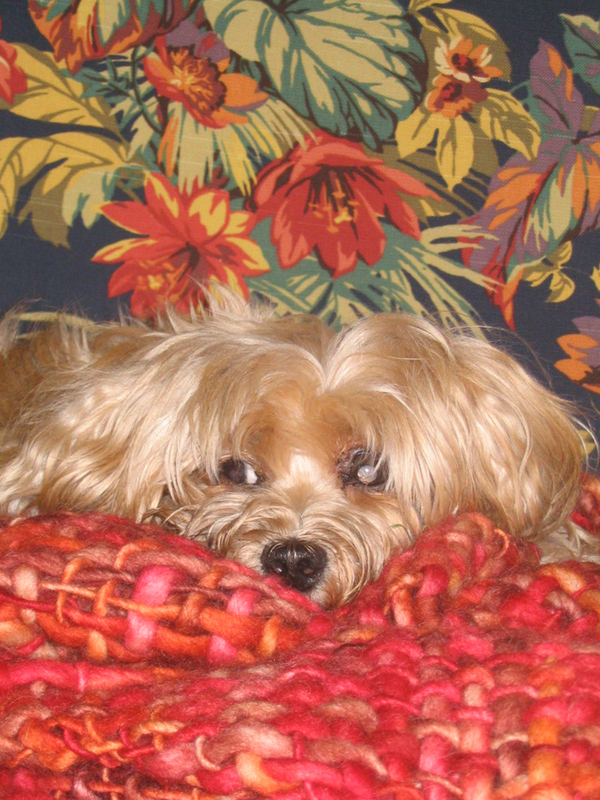 Hannah died on November 17, 2008, lying in our living room where she had lived her whole life. Facing the bay where she swam for so many years. On the island where she was born. We were her whole world, and I feel so lucky to have shared it with her. She never even opened her eyes when the vet came in. Never acknowledged her presence. Never flinched when she got her shot, and never again looked at me when I held her and told her goodbye. She was done with us, and I was so grateful when she was finally gone. It was good, just me and her…kind of the way it all started. I made the doctor stay and talk to me until the people from the crematorium arrived. Two men rolled Hannah's body over onto a portable hammock and carried her out of the house. I thanked the doctor and walked her to the door. It was a beautiful, warm November day in California. I felt the sunshine and the breeze on my face. It was surreal. I was numb. I walked back in the house, shut the door and cried. I cried and choked, and sobbed uncontrollably until there was simply nothing left to come out. I was exhausted. I called Al and told him that Hannah was gone. He came home and we cried together. We cried for days. I have a clipping from a magazine about dogs that says, "On reflection, our lives are often referenced in parts defined by the all-too-short lives of our dogs." Hannah was the end of an era for us. She helped us through some tough times and we shared wonderful, happy times with her, often largely due to her. She was a special girl. A once-in-a-lifetime dog. I will always measure every dog in my life against Hannah. And yes, Sarah, she will live forever, in my heart. but she had bounced around from home to home. We were her last best place and we loved her dearly. Unfortunately, we lost her to bone cancer much too soon. She died in 2012. Tasha looking smarter than she ever was. Al and Vicki currently share their home with two dogs both of whom they rescued. 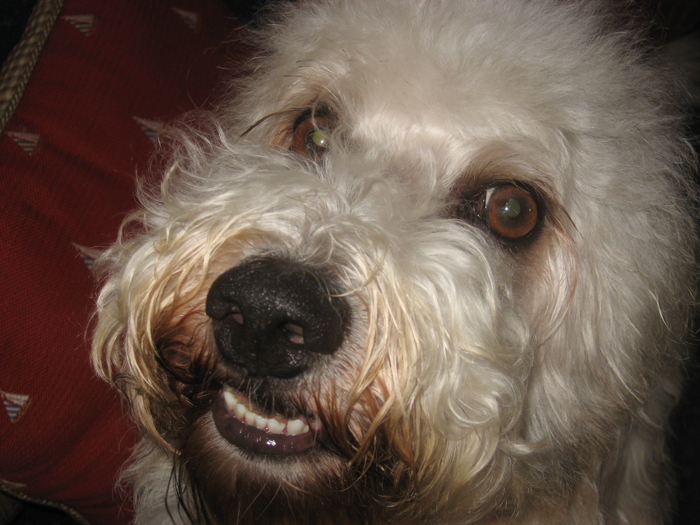 Lucas is a 5 year old purebred PBGV who never got big enough to show. He came from Indiana in 2009.
a nonprofit organization that rescues animals and finds good homes for them. They adopted her in March of 2012, when she was 5.